The MOZA Air X integrates high-precision attitude algorithm, intelligent motion control technology, advanced motor technology, wireless video transmission technology, future material technology, and other' black technologies' with a novel folding submachine gun type body design. It is the ultimate filmmaking tool designed for cinema cameras. The MOZA Air X comes with a 1.4kg gimbal weight with reinforced rigidity and the aerospace grade carbon fiber gimbal arms, which can carry a payload of 13lbs(6kg) and last 20 hours, easily realizing large payload and light weight. 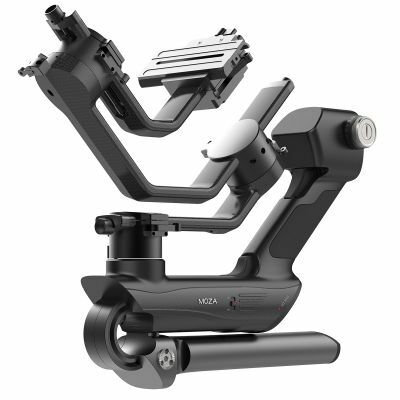 Optimized dual hand-held design, inverted mode design, Foldable design make the gimbal from “Form follows function" to "Equilibrium between form and function". There is no doubt that MOZA Air X will be a milestone in the evolution of film production equipment by changing its six usage forms, using aerospace materials, equipped with advanced motors, fusing the new Deep Red algorithm and having unlimited potential for intelligent expansion. The MOZA Air X's new foldable submachine gun type design allows the gimbal to be unfolded and released freely. After folding, the fuselage is like a 17-inch portable toolbox, which integrates lightness and reliability. It can also reduce the load and is easy to carry. It can also be loaded and photographed quickly. The MOZA Air X's advanced camera movement system creates a 6-axis movement design and gives the stabilizer a flexible and changeable control experience. Six high-precision and high-power density motors control the tilt axis, roll axis, pan axis, focus axis, zoom axis and slider axis of the gimbal. Under the six-axis movement, Air X can realize various working modes, and multiple sensors can accurately sense camera posture and adjust parameters in real time. The innovative detachable wireless thumb controller perfectly matches various forms of Air X to achieve cool play such as somatosensory control and remote focusing. The Air X's wireless thumb controller and smartphone App can both control the six-axis movement in real time, plan the shooting trajectory, freely combine multiple following modes, realize automatic focusing, automatic zooming and other shooting modes. MOZA Air X maintains the excellent time-lapse functions of MOZA series of products. Whether it is time-lapse, hyper-lapse, long exposure time-lapse or zoom time-lapse, it can easily shoot smooth and stable videos. The Air X can also achieve cool video shooting effects such as inception mode, sport gear mode, FPV mode, object tracking, auto-zoom, auto-focus, vertigo shooting and so on. In addition, long exposure and panoramic shooting are also possible. There is also a low-latency wireless video transmission system to ensure wireless transmission of high-definition images, making shooting and creation more convenient. Thanks to the precise control technology of MOZA Deep Red algorithm, MOZA Air X can adjust the camera weight and parameters automatically. It can also automatically diagnose the gimbal state and guide the balance so that the Air X is always in an efficient and stable working state. The MOZA Air X comes with a 1.4kg gimbal weight with reinforced rigidity and the aerospace grade carbon fiber gimbal arms. The motors of Air X consist of high-precision carbon-fiber drive shafts and oilless bearings. Advanced materials and technologies offer stable performance even in harsh condition.